How far has Atlantic City fallen? Trump Plaza, once the centerpiece of Donald Trump’s three-property Atlantic City empire, was sold on Valentine’s Day to a California company for $20 million, the cheapest price ever paid for a Boardwalk casino. Trump spent $210 million to build the hotel-casino in 1984, which at the time was a record amount. Revel’s move to use bankruptcy as a way of erasing more than $1 billion of debt after just 10 months of operation was painted as a necessary action. “We see this as a positive step that will allow Revel to comprehensively address its financial needs while continuing normal business operations,” David Rebuck, director of New Jersey’s Division of Gaming Enforcement, told the Press of Atlantic City. The $2.6 billion Revel halted construction on several occasions because of financing issues. The resort was expected to provide a rebirth to Atlantic City’s gaming market by attracting high-end customers from the East Coast and other regions who were willing to shell out the highest room rates on the Boardwalk. Instead, Revel’s gaming revenues in January were the 11th lowest of the 12 Atlantic City casinos. Revel couldn’t even attract low-end slot players. In 2012, Atlantic City casinos collected $3.05 billion in gaming revenues, the sixth straight annual decline. Tourism leaders, gaming officials and New Jersey Gov. Chris Christie, however, have not given up hope. Caesars Entertainment Corp. owns four Atlantic City casinos – a quarter of the market. Boyd Gaming Corp. is 50 percent owner and operator of the Borgata, the city’s leading producer of gaming revenues. Landry’s Inc. spent $38 million to acquire the Trump Marina in 2011 and rebranded the casino as the Golden Nugget. Clearly these companies haven’t thrown in the towel. New Jersey’s potential for Internet gaming is drawing interest from new Atlantic City casino owners. Christie vetoed an Internet gaming bill earlier this month, but said he would sign a new measure – possibly as early as this week – if certain changes were made, such as a 10-year trial period and higher gaming taxes. 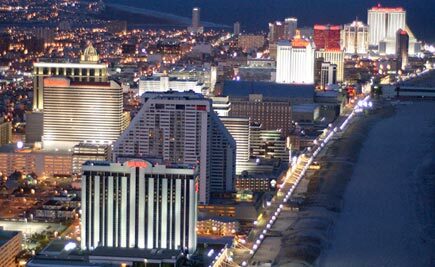 Atlantic City’s 12 casinos are the only entities that can hold the online gaming licenses. As such, the Meruelo Group of Downey, Calif., owners of the Grand Sierra in Reno, bought Trump Plaza. The Rational Group from the Isle of Man, which owns PokersStars.com, is spending $50 million to acquire the money-losing Atlantic Club. Fitch Ratings gaming analyst Michael Paladino said legalized online gaming is a positive move for Atlantic City. Resorts could cross-market between casino and online customers while the convenience might help recapture New Jersey residents who now travel to New York or Pennsylvania to gamble. Paladino said the prospect of online gaming is keeping unprofitable Atlantic City casinos open. “In absence of online gaming, casinos like Atlantic Club would likely close, removing unneeded capacity from the city thus relieving competitive pressure,” Paladino said. Online gaming is not a reason MGM Resorts International wants back into the market. The casino giant gave up its ties to Atlantic City three years ago to settle a dispute with New Jersey gaming regulators. MGM Resorts’ 50 percent ownership in Borgata was placed into a trust and the company had three years to sell its stake. A sale never took place. MGM Resorts Chairman Jim Murren said last week he was never pleased with the settlement, which stemmed from gaming regulators’ unsuitable finding on Hong Kong businesswoman Pansy Ho, the company’s partner in Macau. Earlier this month, New Jersey gave MGM Resorts permission to reapply for the gaming license. What MGM Resorts would do with the license is unclear. The company has no plans to dust off the blueprints for a $5 billion MGM Grand Atlantic City, which was announced in 2007 and would be built next to the Borgata. At this point in the game, Atlantic City needs MGM Resorts much more than the casino company needs the troubled market. Copyright 2013 Stephens Media Interactive GamingWire. Tell New Jersey and Atlantic city to get Southwest, Virgin and Blue to open terminals at the ACX airport. Simply put, cannot get there………………………. I went to Caesar’s and they charged me to park! Sorry, I’ll take my business somewhere else.